Australia – Tucson, Arizona based lighting designer Martin Thomas of Relentless Lighting Design used Robe’s new Pointes for the first time for multi-talented Grammy Award winning singer/songwriter, actress and poet Jill Scott's recent highly successful Australian tour. 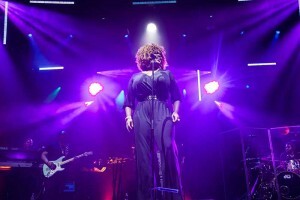 Thomas has worked for Jill Scott since 2007, after working with her previous designer, the late Tyrone 'Admiral' Long on the Sugarwater Festival Tour in 2006. For this tour, the start of a live performance campaign that continues into 2014, he took a complete departure from the last one in terms of the lighting aesthetic, putting intimacy, close communication and a sense of timeless elegance right at the heart of the performance. “The previous tour featured large, dynamic lighting elements while this year’s look is more subtle and refined,” he comments. The 24 Pointes were newly purchased for the tour by Australian lighting vendor Clifton Productions, which has the largest inventory of Robe fixtures in Australia. They were supplied together with 21 LEDWash 600s and 18 ColorSpot 1200E ATs. The lighting rig was essentially based on three trusses and designed to add a vertical aspect, depth and three dimensionality to the show. It also embraced the principles of 'less is more' with Thomas choosing his fixtures carefully and using them as proper multi-functional instruments fulfilling many different roles in the process. Scott takes a keen interest in how Jill looks on stage and is very aware of lighting and how it affects the drama and emotional impact of her performance. The downstage truss featured 12 Pointes which were used throughout the show as hard edged profile key lights in CTO, while the other 12 were distributed around the rest of the rig and used for numerous effects and adding colour and movement. "They are absolutely awesome; one of the most feature packed lighting fixtures I have had the pleasure of using in a long time," comments Thomas. The story began when he was seeking a more flexible replacement for a series of profile spots which he had traditionally used as key lighting for Scott’s shows ever since he became her LD. It had to be a small and bright unit with a good output, specifically at around the 4000K mark. Kevin Loretto from Robe Lighting Inc. sent a Pointe over to Thomas so he could undertake thorough testing and he did a shoot-out between this and several competitor beam light products. This left him with absolutely no doubt about his choice, The Pointe was a very clear winner leaving all the others in the dust! "The CTO is perfect, there are so many effects in there and it does a great generic profile replication," he declares. From there, the wheels were set in motion to get the Pointes in place so he could use them on the Australian tour, which involved Robe’s Australian distributor, The ULA Group who supplied them to Clifton Productions. As soon as he had used the Pointes on the first show there he quickly discovered many more advantages of these highly dynamic fixtures including being able to grab them and modify live for scenarios like the BVs or soloists moving off their marks, etc. Scott was also not the only person who noticed that the lights were truly spectacular for the first Australian show; even monitor engineer Jim Roach thought the individual ring control on the LEDWash 600s looked cool! 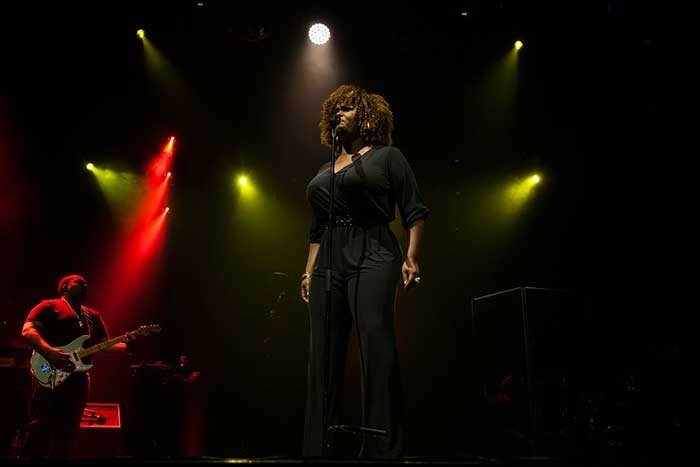 Thomas has used LEDWash 600s on several shows before and "loves” them. The reasons for this include the low heat output, their light weight and slimline profile, the ring control and the nice duo-tones that can be achieved with it, plus the fact that you can create different looks using this without even moving the lights! He especially likes the inner zone which creates a very tight intense collimated beam of light. The 18 ColorSpot 1200E ATs were located throughout the rig, used to texture the stage with gobos, add broad bands of beam light and light the cyc with the stock gobos. All the Robes and other fixtures in the rig which included LED battens were run by Thomas using a grandMA 1 console. Thomas really enjoyed the Australian shows and says that the crew from Clifton Productions was "fantastic" and the kit was really well prepped and maintained. Just as his first experiences with the Pointe were very positive, they echoed his initial use of Robe products ten years ago at an Erykah Badu show in Poland when Robe was still very much the ‘new kid on the block’ in the world of moving light manufacturers. He recalls that back then one of his LD friends - Marcin Michna - was telling him that Robe made “great lights”, and as soon as he tried them for himself, he realised that this was indeed the case!